Editor’s note: Haider Mullick is a fellow at Tufts University, the Institute for Social Policy and Understanding and a lecturer at the Naval Postgraduate School. The views expressed are his own. Last week, evil visited Boston. In the ensuing weeks and months we will debate preventing and fighting terrorism. Why did a 19-year-old Chechen-American allegedly place a bomb next to an eight-year-old child? How can we stop this from happening again? Some think the answers are in expanding security for all, but by restricting civil liberties and immigration of Muslims. Others believe the best response is business as usual – defeating terrorism by not being terrorized. But before we act we must reflect on what we’re trying to protect and punish: American pluralism and intolerance. Unlike the founders of many nation-states, America’s founding fathers did not fight for an ethnic or religious state; they fought for Protestants and Deists, blue blood and blue collar, slave owners and humanitarians, soldiers and Quakers, and British loyalists and British-Americans. Soon after, thousands of Irish, Italians, and Germans arrived, and as years went by the American garden of liberty welcomed the peoples of Asia, Africa and Latin America, and the lonely Christian cross accepted the Star of David, the Islamic Crescent, and Darwin’s fish. The union was – and still is – imperfect and incomplete; yet human malice cannot live long under the seal of E pluribus unum (out of Many, One). Yet oneness is not the negation of diversity. Hyphenated Americans come in all verities of motherlands, religion, creed and race. The American Constitution of fair play is the arbiter between oneness and diversity. We’re free to exercise our religion, but not free to impose it on others, and we’re free to vote with our conscience, but not free to define it for others. The law of the land was not always in spirit with the Declaration of Independence. Life, liberty and the pursuit of happiness excluded blacks, women and the landless. But Americans fought physically for a more perfect union even when the Civil War nearly tore it apart, and morally in the Civil Rights movement. Once you made America home, you became home to the American idea, constantly balancing preservation with improvement. The fact is that although terrorism is inspired by numerous doctrines, the enormity of attacks by those that have robbed Islam of its humanity stand out. 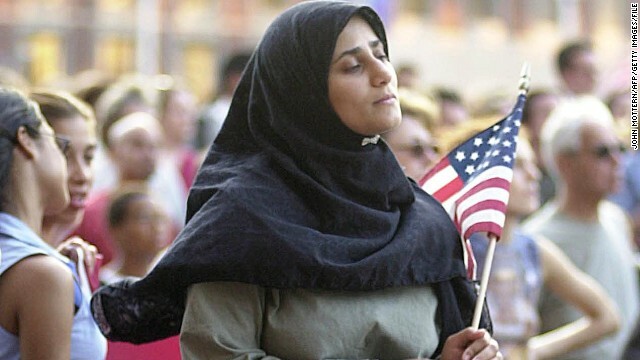 As a result, American Muslims today are asked to prove their love for country. Such mistrust is not new. Early nativists called for the cleansing of the country of the Irish, Germans and Italians, and later of the Japanese and German Americans during and after World War II. Some wanted a Christian country without Jews, and today some want it without Muslims. But violence is violence no matter what cloaks it: religion, ethnicity, or mental disorder. Punishing an entire group of people goes against America’s progress toward creating a better union. Today, we must try and punish Americans who harm us. Not, though, as members of an ethnic or religious group, but as Americans who broke their oath. The message should be clear: American capitalism may be a casino, but American citizenship is a long-term commitment, and American values of democracy and rule of law are not given, but earned. Preventing all terrorism is impossible, but we must work together as Americans. We must realize the great contributions of Muslim scientists, professors, doctors, lawyers, entrepreneurs, soldiers and law enforcement personnel to our American life. Many Muslim American patriots work tirelessly to protect us from threats every day. They leverage their wisdom, cultural diversity and linguistic skills to uphold our Constitution against all enemies, foreign and domestic. Yes, there are Muslim Americans who have hurt us, like Colleen LaRose and Major Nidal Hasan. But Muslim Americans should continue to help prevent and deter such attacks when they can – this is not the time to divide and scare the ones who stand to gain the most from preventing terrorist attacks. Protecting pluralism and punishing intolerance is quintessentially American. I’m a Muslim American: Lincoln inspires me, Marines embrace me, and God humbles me. If I break the law put me on trial, but don’t tread on me. « Previous entryWhat next with North Korea? 9/11 was the result of American traitors. The war on terror is a fraud. And yet you texans still vote republican. I can prove it. What should have been inside the Pentagon on 9/11. Recently released video shows damage consistent with a cruise missile, but no airplane and no bad fire. Please, only thoughtful people reply,. You're an insane kook. There was airplane debris everywhere. TX patriot, the 9/11 terrorists were imported mass-murders. Traitors are home-grown. Now, Mr. Mullick, as American citizenship has to be earned, the US could as well strip its enemies of state of their nationality, if these people pose a national threat, don't commit themselves to respecting the rule of law and America's democratic values. Only a tin foil fool from Texas would be so completely unmoved by a real tragedy in another state and call it fiction. Yeah, so,was that ferilizer blast "fiction" or did your idiot governor fart? True It was conceived by Lincoln when he was president. Actually TX Patriot, the so-called "war on terror" is a war for U.S. expansionism halfway around the world. In fact, George W. Bush used 9/11 for a pretext to invade Afghanistan in 2001. And don't punish gun owners for newtown. I would like to know where are the Muslim clerics who should be denouncing this heinous act? If they truly are against terrorism they should be in the media saying so. I believe they're quietly thrilled that some more infidels got killed. They are denouncing Hindus and Jews for radicalizing innocent Muslim children. Amazing what you can find if you bother to look isn't it? US should ban immigration from Muslim countries. Too late. We have too many Muslims in our midst already. We should consider deporting them. ABSOLUTELY RIGHT. And start immediately. TREAT THEM EXACTLY AS THEY THINK OF US AND TREAT US AN EYE FOR AN EYE AND A TOOTH FOR A TOOTH. I agree that an entire religion or group of people shouldn't be punished for the actions of some but the teachings and the anger and the hatred is being fueled somewhere and it needs to be investigated and rooted out. I'm sick of the fact that because it's not PC we can't question Muslims, investigate mosques, etc. I don't really care if the people get angry (whether they're Muslims or Christians or white, brown, black or green). Our brothers and sisters and children are getting killed all over the place and we're worried about hurting feelings. Ask the families of Martin Richard, Lingzi Lu, Krystle Campbell and Sean Collier how they're feeling right about now. What are you talking about? The first person detained for the Boston bombings was a Saudi who happened to be in the wrong place at the wrong time. Radical mosques are investigated all the time. We should ban immigration from Muslim countries and do a better job of listening for foreign governments about the dangers posed by the immigrants we do allow in. OK, Prof we should not punish Muslims for the Boston bombing even though it was Muslim who did it. We should pick whipping boy, right? What about Hindus? After all they are not Allah's children and are Kafirs as they worship too many Gods. So let us make horrible, horrible example of them. Let use round them and deport them. It will defintely teach the Muslims a lesson they wont forget as they next time we will go after them. Are you happy prof? I'm buddhist never herd of buddhist planting a bomb !.....it's not the religon..its the way ones brought up, but more muslims and hindus tend to fight alot it comes with in them the hatered, but with in them you do find a few good people!. By your reasoning, The next time a white person fires a gun during the commission of a crime, we should deport everyone of European descent. Bigotry is underscored by poor mental development. Therefore, engaging in a verbal battle with a bigot is in itself bigotry. Unfortunately JAL, bigotry is sweeping the country right now. This is why the Tea Party Movement is flourishing today! Seeing Muslims attend Friday prayers is an inspirational highlight. "... don't tread on me." Very disappointing finish to a plea for tolerance and understanding. There are approx 1.6 billion Muslims around the world today. 99.9999% of them live peaceful lives and do not commit crimes. It always amazes me to see posts here on CNN and other places blaming Islam. How easily they forget the likes of David Koresh or Anders Behring Breivik or the Oklahoma City bombing. As JAL suggested above, bigotry is indeed an epidemic of the weak minded. Quite true, Ferhat. Like you and JAL said, bigotry is indeed endemic among the weak minded and that in turn produces the right-wing lynch mob mentality currently sweeping the country today and like Kerry already said, that is what's feeding the Tea Party Movement! This is what the right-wing politicians are taking advantage of! It makes me sad to see such a well-written, intelligent essay followed by so many ignorant comments by people who just don't get it. As an atheist, sometimes I'd like to kick all you god freaks out of the country for all the trouble you cause but guess what, that's not the way it works. Try traveling to a Muslim country before you condemn every one of them. Or even "all but a few." Try talking to members of our military who fought side by side with them. Your paranoia would mean the deportation of my Sister-in-law and her 9 year old daughter. My Brother met her when he was doing relief work in Indonesia. Now she works part time for a charity helping needy Americans and her daughter gets straight A's and their family receives no gov't handouts and never has but I guess we should kick her out because you're stupid reactionary minds need to blame a whole group instead of the responsible individuals. Those guys were no different than the kids who did Columbine or other mass killings except they had a handy radical religious agenda to latch onto. If we're going to kick out an ethnic group that came to this country and started terrorizing people and used biological warfare and committed genocide then I think white Christians are the place to start. But instead lets just chill, heal our wounds and not let any terrorists stop us from being a diverse, open culture. Sorry J Baker, one cannot rid this country of the right-wing lynch mob mentality toward the Muslims overnight. There is just too much ignorance for that to occur. Most people here are going to hate Muslims, no matter what and due to our stupid foreign policy, the overseas Muslims will feel just as bad about we Americans! After all, when America awake and understand, it will say, enough is enough. America is only for Christians, as it has been found/established by Christian founding Fathers. This proves that, how long it did take to the U.S.A to become like Saudi-Arabia, when it comes to recognizing and respecting only One Religion. In Saudi-Arabia, you could get killed or Jailed and torched, if you are found practising CHRISTIANITY, even in your own bedroom. I shall copy this and pate it on my facebook page. I believe it is permitted. All Terrorists are Muslims…Except the 94% that Aren’t.